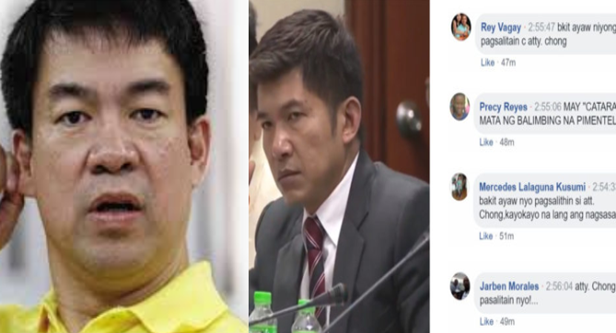 Home / Trending / Chong supporters are exceptionally upset to Senator Koko Pimentel: "BAWAL ANG FOLLOW-UP QUESTIONS." Chong supporters are exceptionally upset to Senator Koko Pimentel: "BAWAL ANG FOLLOW-UP QUESTIONS." Some people noticed that contrasting to the first hearing, Glenn Chong was not given an opportunity to talk today, and he was only given a one time opportunity to speak. During the second Senate probe on the alleged cheating happened in 2016, some of Atty. Glen Chong’s supporters could not prevent themselves from criticizing the senators who are present. According to Chong he will uncover something explosive amid the hearing, however it appears that he did not reveal what he wanted today due to the less time allotted to him. Chong addressed why in spite of the disagreements being faced by the electronic voting company internationally and locally, COMELEC is still entertaining Smartmatic. Chong also said that Cavite is trying to trade voter’s database to politicians during the former election of Maragondon. He also showed a portion of the video clips and yet before he exhibited it, Sixto Brillantes Jr. the previous COMELEC executive has drawn in with him. That is the only time when Chong allowed talking and a portion of his supporters are exceptionally upset. Significantly blogger RJ 'Thinking Pinoy' Nieto additionally saw that there's some kind of problem with the Senate hearing today. “Parang may unwritten rule sa Senate Hearing kanina na whenever someone raises valid, interesting, and well-informed points, BAWAL ANG FOLLOW-UP QUESTIONS. Natuto na yata after nung bonggang pasabog last hearing ni Glenn Chong.” he added. Below are some of the reactions from netizens and it has been a trending topic in social media for the past 2 consecutive days after the Senate hearing.